believes the motivations are obvious, and that the answer will swing the election his way. 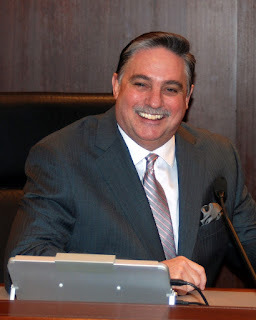 Smythe offered, "I got in this race because I was tired of, and concerned by, the network of cronies and insiders that have come to dominate Hamilton County politics”. The contrast is stark. Smythe's opponent, also standing for election for the first time, has spent the past three years raising over $170,000 from vendors who do business or want to do business with Hamilton County, and works as a salesman for a company that bids on multi-million dollar projects with county governments throughout the state. This opponent has recently been implicated in a so-called "pay-to-play" scandal. South Bend media initially reported that Smythe's opponent, salesman Mark Heirbrandt, emailed a county official from whom his company is seeking a multi-million dollar contract and volunteered to help her raise $100,000-$120,000 for her campaign saying he "can provide some assistance" and that he "spoke to several vendors that feel they can help you." While some media outlets have questioned whether the county prosecutor should look into the matter, Smythe noted, "Legality is an awfully low bar to set for our public officials. Hamilton County voters should expect more. At a minimum, they should expect a commissioner who puts taxpayers first, and who is not in the business of soliciting fat contracts from county governments while also soliciting hundreds of thousand dollars from other contractors." Smythe filed to run in February, rolling out the slogan "Voters of Vendors." Now Hamilton County voters can see clearly what he meant. FISHERS, Indiana - Amid reports out of South Bend that have hit central Indiana media outlets questioning whether Hamilton County Commissioner Mark Heirbrandt was leveraging campaign contributions to a St. Joseph County Commissioner in return for a contract for Heirbrandt's employer, Fishers businessman Bill Smythe again is asking, "How much money is enough?" Smythe added, "This scandal demonstrates precisely why I got into this race in the first place." Smythe, who has owned and operated Claude & Annie's at 141st Street and State Route 37 since the early 2000s, has promised to place "voters over vendors" in his campaign against Heirbrandt, who is also running for the first time after being elected to fill a vacancy at a caucus run by former Hamilton County chairman Pete Emigh. Smythe has an uphill battle. Heirbrandt's most recent campaign report showed over $170,000.00 raised primarily from construction companies and other companies doing business with the county, money already being used to run television ads on Indianapolis outlets in his campaign for a local county office. "I have confidence in the voters of Hamilton County," commented Smythe. "I believe on May 3, Hamilton County Republicans will reject crony capitalism in favor of a businessman who will listen to voters, and who will consider the benefits the people will receive from County contractors, as opposed to the benefits the contractors will receive from the people." Bill Smythe is a long time Fishers resident and businessman with a history of standing up to government overreach and successfully fighting tax increases. He got into this race promising clear lines of communication as projects are planned, not just when they are announced, transparency in county spending, fighting the heroin epidemic in Hamilton County, and placing voters over vendors. The Religious Right started a battle with Planned Parenthood and it led to violence, Catholic churches preach that abortion is murder then act shocked when one of their believers shoots an abortion doctor. If these were Muslims it would be called terrorism, why isn't it called terrorism when it's Christians? No- Anon 3:53!!! Violence is murder of the innocent!!! Why isn't it called terrorism, considering the total number of those killed / eliminated from life? What's wrong with you?!? MUNCIE — Allegations of government corruption in Muncie will not be investigated through any probe that begins in the Delaware County prosecutor's office. That's the word from County Prosecutor Jeffrey Arnold, who told The Star Press that his office doesn't have the time or manpower to investigate such allegations. Beyond that, however, Arnold said that's not the function of the prosecuting attorney, in his opinion. "I occasionally hear, 'Why doesn't the prosecutor's office investigate or do something about (whatever)," Arnold said this week. "The simple answer is we don't independently investigate allegations of criminal activity. "We would become witnesses in our own case. We rely on law enforcement agencies who have the training, expertise and manpower to investigate allegations of criminal wrongdoing." Arnold's comments came in the wake of questions from The Star Press about recent articles and, Arnold noted, comments he's seen people make on social media like Facebook and Twitter. The Muncie Sanitary District's purchase, for $395,000, of a flea market building that sold weeks before for $150,000. Building demolitions overseen by the Muncie building commissioner's office as well as their cost and timing and contracts awarded to a company co-owned by building commissioner Craig Nichols. Allegations made in a federal court lawsuit filed against city officials by a local demolition company that the company couldn't win contracts in part because it didn't donate to the local Democratic Party. A letter from fired city worker Gretchen Cheesman offering to tell Mayor Dennis Tyler what she knows about demolitions and alleged misconduct by officials if Tyler would change her status from fired to retired with full benefits, including health insurance. Arnold said that while he was aware of those allegations, any investigation needed to begin with a police agency. "If someone believes a crime was committed, they should contact a local, state or federal law enforcement agency and request that agency open an investigation," Arnold said. " ... Once a law enforcement agency completes its investigation, it will send the case to our office for review. We routinely receive cases from local and state law enforcement agencies. If there is probable cause to believe a crime was committed, we may then consider whether to file formal charges or ask for further investigation." Arnold also indicated he is not likely to use a grand jury to investigate such allegations. A grand jury, which can be requested by a prosecutor and empaneled by a judge, has been an occasional tool of Delaware County prosecutors. Grand juries are made up of citizens and meet in secret and prosecutors can compel witnesses to come and testify. "Oftentimes people ask about the use of grand juries to investigate," Arnold said. "Although we have seated a grand jury in the past, we do not routinely empanel a grand jury, nor is there one currently empaneled. When we take a case to a grand jury, it is only after a law enforcement agency has thoroughly investigated the allegations in issue. The grand jury can be a tool to compel testimony of a reluctant witness or to assist our office in deciding what charges, if any, should be filed in any given fact situation." Seems like some prosecutors won't investigate.....so, who does? Pete Boggs, abortion is a legal medical procedure. Even though the church you were indoctrinated into, or cult, says otherwise that doesn't change that FACT. Stop pushing your religious dogma onto others, you'd fit right into a Sharia Law country. You're un-American. Maybe we should start calling Muslim terrorists mentally ill like we do Christian terrorists. When discussing whether abortion should be legal, or whether we should pay for it indirectly by subsidizing Planned Parenthood, the argument that abortion is a "legal medical procedure" is not real persuasive. As far as the simplistic notion that anti-abortion feelings are driven by "religious dogma," do you realize that there are many, many atheists who are against abortion? A lot of us are driven in our feelings by the indisputable medical fact that abortion results in the end of human life. Unfortunately many pro abortion rights people simply don't care about science when it comes to the issue.